Alloy - Coin metal consisting of two or more metals which are melted and mixed together. Example --- the 5 cent nickel is an alloy consisting of 95% copper and 5% nickel. Alteration - An illegally changed coin feature (such as date or Mint mark) to make it appear like a more valuable coin. Example --- the 1922 penny is worth 30 times more with the Mint mark "D" than with it. Many 1922-D coins have been unethically altered to remove the Mint mark "D" hoping to sell it to an unknowing buyer. ANA - Abbreviation for American Numismatics Association, established in 1891. Largest organization of coin collectors in the world. Annealing - The manufacturing process of heating the coin metal (planchet) just before striking. This softens the metal enough to receive the impression. ANA - American Numismatic Society. Bag Mark - A scratch or ding caused by coins rubbing against each other in a Mint bag. Very common, especially with large heavy silver coins. Bit - An old Mexican coin circulated in America during the 1800's. This coin was sometimes divided into sections. A "bit" was one eighth of the coin, two "bits" was one quarter of the coin, therefor USA quarter dollars began to be called "two bits." Blackbook - Pocket size price guide and reference book of USA coins. Updated and published annually since 1962. Blanking - The manufacturing process of passing the coin metal strip through a punch press to "bang" out the round metal coin blanks (planchets). Blemish - A minor nick, mark, dent or discoloration on the coin's surface. 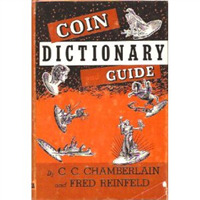 Bluebook - Handbook of USA coins published annually since 1941. Gives average prices dealers pay for coins. Broadstrike - A coin with a larger than normal diameter. This is caused by the coin being struck with the protective collar in place. Brockage - A coin error in which one side of the coin has a "mirror image" of the other side. This is caused by the failure of the coin to be automatically ejected from the holder on the coin press. Bronze - An alloy metal consisting of copper and tin. Zinc is sometimes included. Bullion - Coins produced of high purity metal, such as 999 fine silver or gold coins. Also, blocks of pure gold or silver. Cast Coin - A coin manufactured by a process of pouring metal into a mold, rather than die striking. Quarter Eagle - A USA $2.50 face value gold coin, minted from 1796 to 1929. 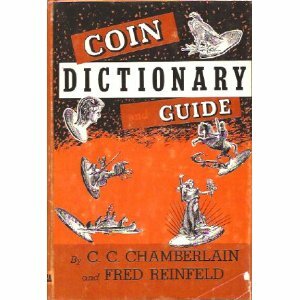 Redbook - A guidebook of USA coins published and updated annually since 1947, Gives average selling prices by dealers for USA coins. Reeded Edge - Grooved lines that run vertically around the coin. Used on all modern USA coins from dime to dollar to discourage dishonest practice of clipping off part of the metal.